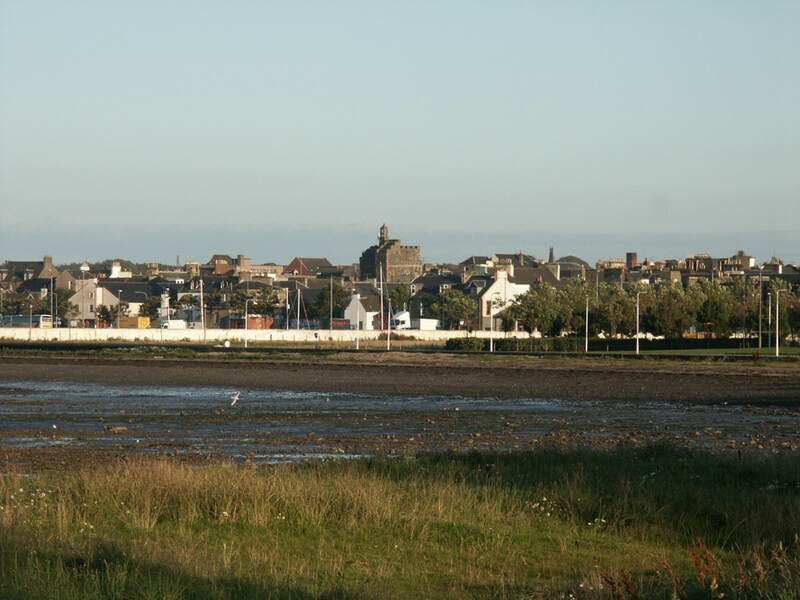 Gaelic "an t-Sròn reamhar" - "the fat nose" or "broad headland" ​ OR from Strandraw or Stranrawer - the Strand burn dividing a raw (row) of houses - this burn has subsequently been buried under North and South Strand Street, near the Castle of St John in the middle of the town. Stranraer is the end of the line, literally as far as the railway; the A75 and NCN73 are concerned. The A77 passes through on its way to Portpatrick - as the railway once did. Situated at the south of Loch Ryan, it became the ferry port of choice for Irish traffic, once Portpatrick was deemed too small, but it in turn has been surpassed by Cairryan. Stranraer (Harbour) station was always poorly placed to serve the town, but has had to do so since the closure of the 'Port Road' line from Dumfries in 1966. 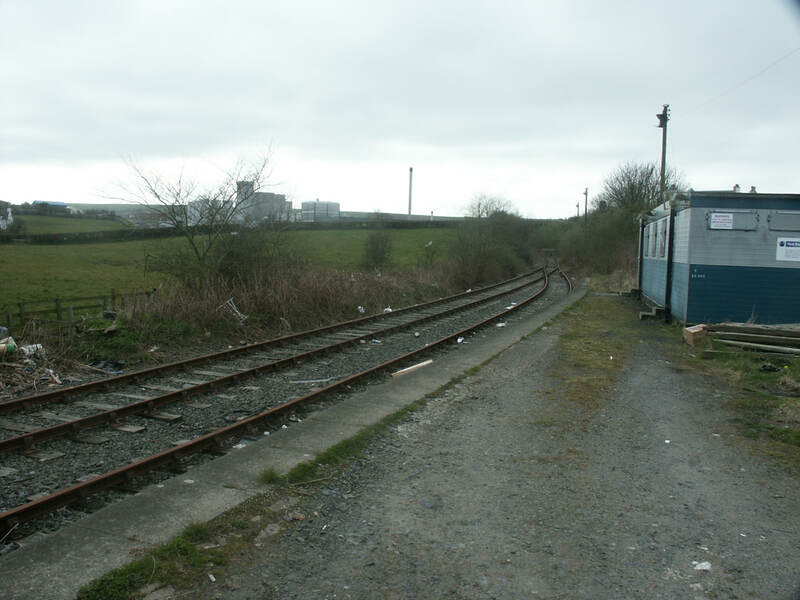 The freight facilities associated with the Town station were used until 2009, and have recently been removed. New Luce was created when the former Glenluce parish was split; being the northerly part mainly between the Main Water of Luce and the Tarf Water, with New Luce the only substantial settlement - the Cross Water of Luce joins the Main Water of Luce at New Luce to form the Water of Luce. New Luce has bridges over both rivers. Old Luce covered Glen Luce and Dunragit. The Luce Water unlike most other rivers in the SW is not tidal and could not handle ships of any useful size, so no port developed. It shares its sandy estuary with the Piltanton Burn flowing from the west. Stranraer did once have a distillery, but according to Misako Udo, it didn't last long - the only recorded licensee was a John McKie jr between 1825-30 - of course it may have run unlicensed before that. It was around the current junction of London Road and Lochryan Street, but nothing is shown on the 1847 map. Bladnoch Distillery (26 miles) is now the nearest distillery. Nearest specialist whisky shops: AD Rattray, Kirkoswald (40 miles); Robbie's Drams, Ayr (51 miles); TB Watson, Dumfries (70 miles). Glenluce (Gaelic "leud" - "wide" or Latin "vallis lucis" - "valley of light") calls itself the historic heart of Wigtownshire. Glenluce Abbey established in 1192, as a daughter house to Dundreddan, is a mile north of the village, which came into being as the Abbey grew rich from 1400, though initially known as Ballinclach ("stone village") and became a burgh in 1496. Renamed Glenluce in 1705, and with the building of the Military Road, Glenluce became an important market, with additional roads to Ayr and Wigtown. After the reformation, the abbey fell into disrepair until 1933. It is now part of Historic Scotland's remit. The chapter house from around 1500 has retained its roof and windows. Castle of Park, a well-preserved tower house from the 16th century now managed by the Landmark Trust and available for self-catering, is on the west of the Water of Luce, close to the village's most prominent feature - the viaduct that carried the Portpatrick Railway over the Luce and twice across the Old Military Road, as it looped round to use the Bridge of Park. 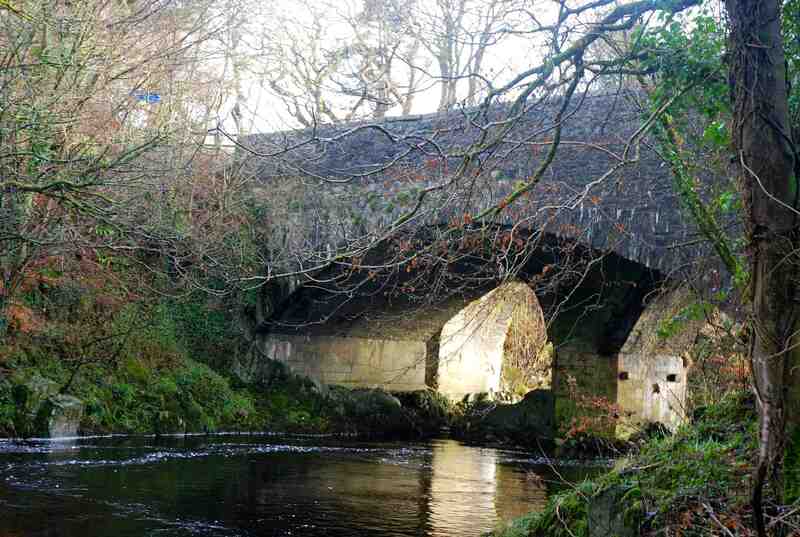 This crossing is believed to date from as early as 1590, and though reported collapsed in 1666, the two arches of the older part of the bridge are different, one may be from the original bridge; a further single arch was added to widen the bridge at the time of the New Statistical Account of Scotland in 1839. The Railway and Glenluce station closed in 1965 and the A75 by-pass was built in 1989. To a small village a by-pass can be a mixed blessing, and subsequently the Glenluce and Kings Arms Hotels have closed. More information on the village village website and Old Luce Development Trust. New Luce was a stop on the Girvan and Portpatrick Railway built in 1877, which was one of only two stations between Barrrhill and Challoch Junction. 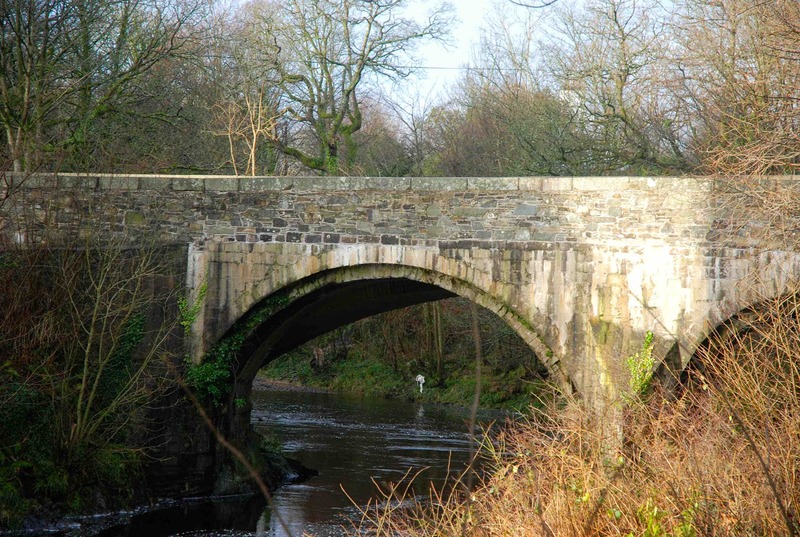 The bridge over the Cross Water of Luce is shown on the 1750 Roy map (the bridge over the Main Water of Luce isn't), so if British Listed Buildings is correct about it being late 18th century, there may have been a previous bridge. The village has a historical website. Evidence of ancient settlement is at Glenterrow Standing Stones - 4 stones, believed to be part of a larger number - "stepping-stones, extending about a quarter of a mile" are recorded in the New Statistical Account of Scotland. By the beginning of the 20th century the rest of these had vanished into the bog. Glenwhilly (Gaelic "gleann choille" - "glen of the wood") is a former railway station that still has a signal box, because of a passing loop on the single track line. Quite why it ever had a station is the bigger mystery, as there wasn't a settlement there or anywhere near - maybe its just down to someone who's sense of humour never developed...or maybe it was just convenient for climbing Glenkitten Fell. Now it has a Geocache - and the Meaning of Liff defines Glenwhilly as - "A small tartan pouch worn beneath the kilt during the thistle-harvest." Dunragit (Gaelic "dun rheged" - "fort of Reghed") small village close to Luce Bay, and grew up close to Dunragit House, but it has considerable ancient history - though not visible above ground, archaeological excavation has revealed the remains of three massive concentric timber circles, the largest 300m in diameter, believed to date from 2500 BCE. Dunragit was on the Old Military Road to Portpatrick, and the A75, until by-passed in 2014 - the route was chosen to avoid known archaeological sites, but also revealed previously unknown sites spanning 7000 years of activity. The village also had a station, close to the former Challoch Junction, which closed in 1965. Cairnryan is a small linear settlement about six miles north of Stranraer on the A77. Estalished around Lochryan House, built in 1701, it was nothing more than a staging post on the road to Girvan, until it became a port. It did have a railway connection, the Cairnryan Military Railway, built in 1942 for military use during WWII, but only shown on the OS 7th series maps. Work had also been done to construct a deep water port at Cairnryan (or No. 2 Military Port as it was called), and though further construction would be required, paved the way for today's ferry port. That came too late to save the railway connection, which saw little use after the military base was closed in 1959, with the line lifted by 1967. 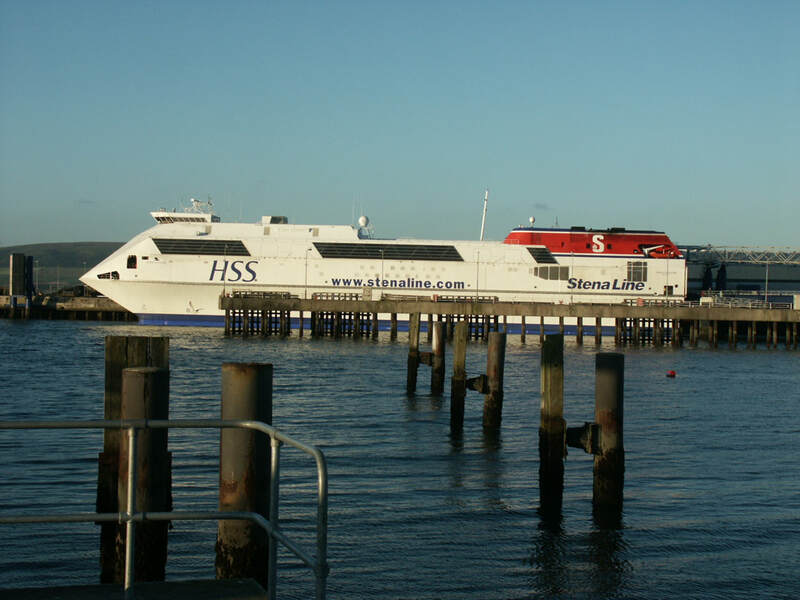 P&O built a terminal facility for their ferries in the 1970s, and Stenna moved its services to Cairnryan in 2011 cutting 4-5 miles off their crossings. ​Castle Kennedy is a small village, unsurprisingly named after the nearby ruined castle, built in 1607 on the site of an earlier castle, but burned down in 1716 - it remains as a focal point for the Gardens, which are open to the public. The Castle itself lies on a strip of land between the Black Loch (or Loch Crindil) and the White Loch (or Loch of Inch) - a canal links the lochs. Lochinch Castle to the north of the White Loch, was built as a replacement for the ruined castle in the mid-19th century. The Southern Upland Way passes through the village and then close to the old castle. The village had a station, the last before Stranraer, and trains from Glasgow still pass the site - it closed in 1965. Soulseat Abbey is believed to have been on a promontory into Soulseat Loch just south of Castle Kennedy. The abbey was devastated by wars in the 14th century. Castle Kennedy Airfield was first used in 1913, but fell into disuse after WWI. During WWII concrete runways were built, but it closed again in 1946. It's been used intermittently as an airfield; and for karting - David Coulthard began racing here. Innermessan was the original major settlement on Loch Ryan - until around 1595 when Stranraer was granted market town status - the old market town of Innermessan soon declined and then vanished. It is thought that it lay east and west of the Motte marked on the modern map, in which case much of the town is lost under Loch Ryan. The Innermessan burn is fed by the Black Loch at Castle Kennedy and burns from the Braid Fell and runs quite swiftly - it powered two mills, one of which had a 'malting still'. The town also had a harbour mentioned in a charter of 1688 and was famous for its boatbuilders. Innermessan today - the farm and, to the left, the gorse-covered Motte. Dorret and Roy maps from 1750 showing importance of Invermessan as it was then spelt. 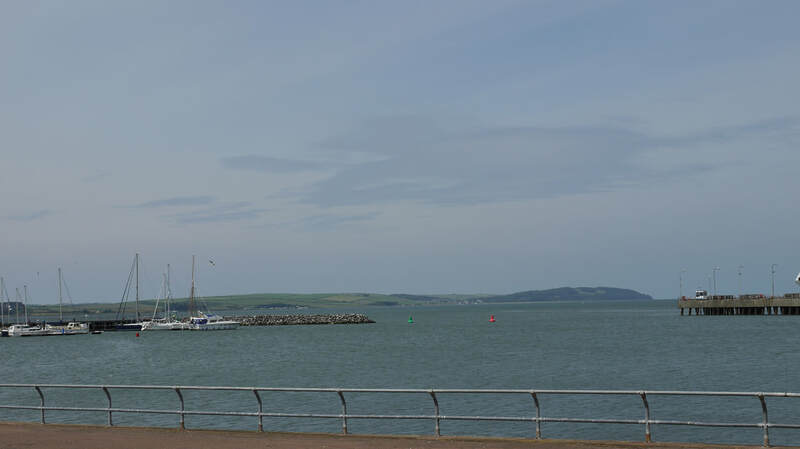 Stranraer is the second largest town in Dumfries and Galloway (after Dumfries) and stands at the head of Loch Ryan. It was created a Burgh of Barony in 1596 and a Royal Burgh by James VI in 1617. In its early days the area was also known as Chapel. 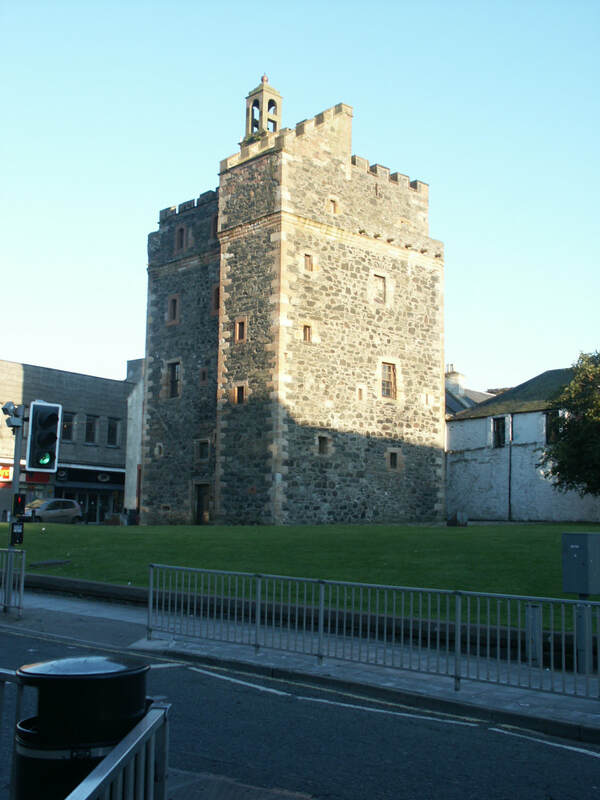 Stranraer's centre piece building is the Castle of St John, a 16th century castellated tower house - its history includes use as a court, prison, military garrison for Government troops during the Killing Time; and as a police station. It is now a museum telling its own history. Remnants of old quays at Clayhole and North West Castle are shown on the first OS maps, but the first real pier built was the old or West Pier - though it no longer projects into the Loch following the reclamation of land to form Agnew Park. The East or Railway Pier was built in 1861, though Portpatrick was still seen as the main Irish port at this time. By 1872 the arrival of paddle steamer 'Princess Lousie' to ply the route to Larne signalled the end of Portpatrick, which was too small for the new ship. ​The Town Hall was built in 1776 "a fine example of a late eighteenth century tollbooth"; tolls and taxes were collected, and it housed the jail until that moved to the castle; it now houses the Stranraer Museum. The North West Castle, which was built by Sir John Ross in 1820, an Arctic explorer who made a couple of unsuccessful attempts to find the Northwest passage, and become the first European to reach the North Magnetic Pole. He has a relatively obscure strait named after him, but the more famous Ross Sea and Ice Shelf in Antarctica are named for his nephew, James Ross. The North West Castle has been an hotel since 1962, and has an indoor curling rink. For the whole of the 20th century Stranraer was the main port for ferries to Ireland, though P&O had left by 1996; by 2011 all the ferries had gone up the coast to Cairnryan. This leaves Stranraer with the need to re-invent itself, not an easy task for a remote town. Stranraer was the scene for my first ever Deep Fried Mars Bar!